A home’s plumbing systems are a broad network of water and gas supply pipes, drain-waste-vent plumbing, and more. 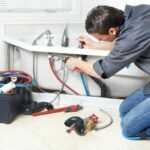 An expert overview of home plumbing systems, including water supply, drain-waste-vent, and more. If you have ever camped in the great outdoors, you have probably been reawakened to the joys of modern plumbing. By going without running water, a hot shower, or a flushing toilet, you can fully appreciate how important these are to daily life. A home’s plumbing system is a complex network of water supply pipes, drainpipes, vent pipes, and more. Because plumbing is complicated and one of the costliest systems to repair or install in a home, it pays to understand how the system works. 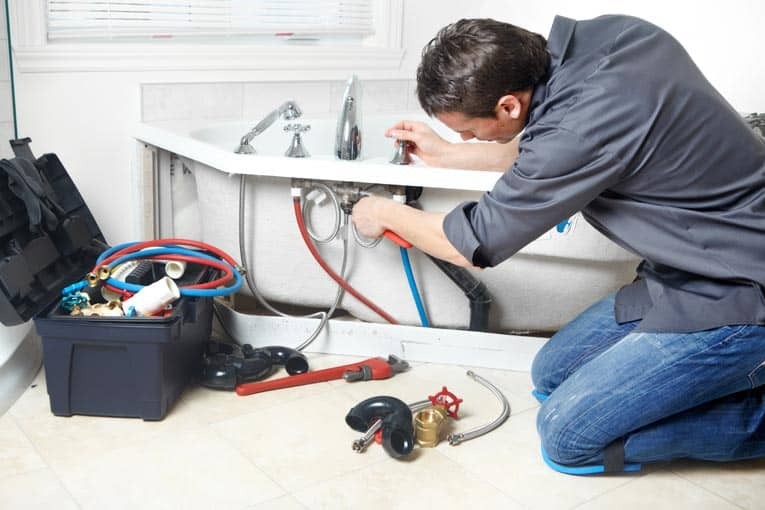 Understanding the fundamentals of a plumbing system allows you to better understand the types of problems that occur or, if you’re planning a remodel or new home, it helps you design a system that will work properly and pass plumbing codes. Regarding planning for major plumbing work: A properly designed system will deliver water to the various faucets, fixtures, and water-using appliances efficiently and carry away waste water without clogs. Second, it may save you money. By planning wisely, you can often reduce the overall plumbing expense significantly by locating bathrooms, kitchens, or laundry rooms near one another so that they can share parts of the system. 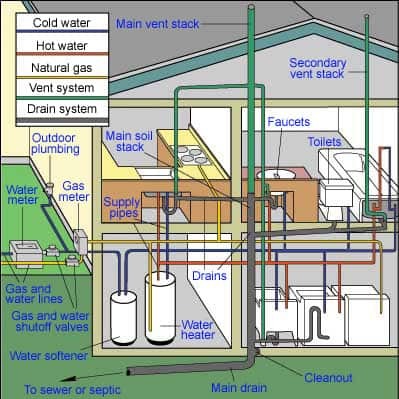 Several different systems make up a house’s plumbing. Fresh water is delivered to a home through water supply pipes from the utility or a well and is then distributed to sinks, toilets, washers, bathtubs, and related fixtures. The drain-waste-vent system carries away used water and wastes to sewers or septic tanks. Natural-gas plumbing delivers this fuel to gas-burning cooktops, furnaces, water heaters, and clothes dryers. For information on water heaters, see Water Heaters & Dispensers. A home’s water supply system routes municipal water from the street to your house, where it branches out to deliver the water to faucets, showers, toilets, bathtubs, and appliances such as the water heater, dishwasher, and washing machine. The equipment for this delivery and distribution is essentially a system of water pipes, fittings, service valves, and faucets. 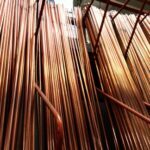 These pipes and other fittings are commonly made of plastic, copper, or galvanized iron. 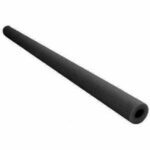 The pipes range in diameter from 1/2 inch to 4 inches or more. Though it isn’t one of the most glamorous parts of a house, the drain-waste-vent (DWV) system is one of the most crucial. 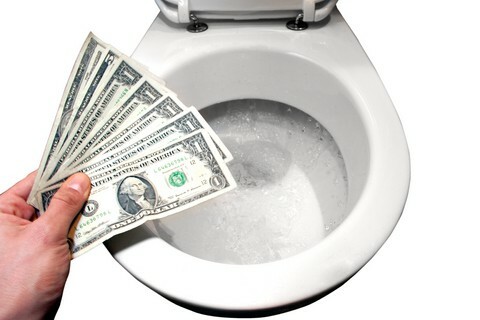 The job of the drain-waste part of the system is to carry waste water and sewage from sinks, bathtubs, showers, toilets, and water-using appliances such as dishwashers and washing machines and deliver those wastes to the septic tank or public sewer. The vent system—part of the plumbing that is usually less well known to most homeowners—is connected to the drain-waste piping, and its job is to ventilate sewage gases so they don’t build up in the house. The vent system also helps drainpipes maintain the right pressure for proper drainage. The pipes of the DWV system are usually out of sight, hidden in the walls, beneath the floors, and in the attic. But when the system ceases to do its job properly, it is hardly out of mind. Clogged drains are among the most common problems that occur in a DWV system. If you’re reading this section, the chances are pretty good that either 1) you’re having problems with the pipes or drains in your kitchen or 2) you’re considering (or are in the midst of) a kitchen remodeling project that involves dealing with the pipes in the floor and walls. 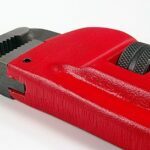 You’ll find help with both of these kinds of issues here, where we look at planning, installing, and caring for plumbing with a focus on the kitchen. Most kitchens have a fairly simple plumbing setup that includes hot and cold water supply lines to the faucets; a waste line for the sink (or sinks); and, for kitchens with a gas range, a gas supply pipe. Many kitchens also have hookups for a dishwasher, disposer, ice maker, and/or instant hot water, but these are generally tied in to the sink’s plumbing. For more about kitchen plumbing, refer to the Appliances section. Sinks, showers, bathtubs, and toilets—bathrooms are all about plumbing. The plumbing in a bathroom must handle water delivery to and waste removal from all of these fixtures in an organized, efficient, leak-free manner. Two plumbing systems are needed to handle a bathroom’s plumbing needs: water supply and drain-waste-vent. 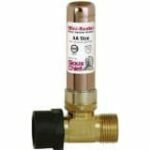 Water supply plumbing delivers hot and cold water to the sinks, tub, toilet, and shower. This system originates at the municipal supply or other fresh water source, goes through the meter, and is delivered to the house. At the water heater, it splits into two lines—one that carries cold water and the other that delivers hot water from the water heater to the fixtures that require it. 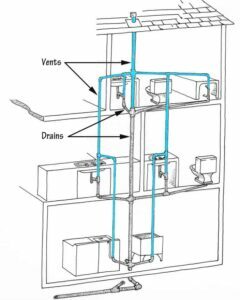 The drain-waste-vent system collects waste water from fixtures and waste from toilets and delivers them to the sewer or septic system. Near each of the sinks, tubs, showers, and toilets, vent pipes exhaust sewer gases up and out the roof and provide air pressure so wastes can flow freely. For information on how to buy, install, and care for bathroom fixtures, use the HomeTips search box to specific searches.